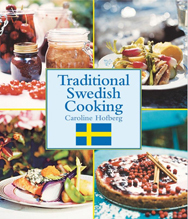 Caroline Hofberg offers a mouthwatering collection of modern and classic Swedish dishes, Focusing on the flavors and foods native to Sweden, such as fresh dill, horseradish, allspice, juniper berries, fish, blueberries, and apples. From apple pancakes and lingonberry chutney to baby potato salad with asparagus and cod with horseradish aioli, every recipe holds onto Swedish tradition while adding a fresh twist. Beautiful, full-color photographs will inspire any cook.